May 20, 2009: We would like to invite our users to help us test the new Spyware Terminator 2.5.7.126 Beta version that's been enhanced to improve your user experience and keep you up to date with the most recent threats and the latest algorithms for removing those threats. Read the whole article to learn more about the new features that this beta version offers. To help you keep your spyware database and application current ensuring the best possible protection, we've extended the method of updating them by adding a new built-in client-to-client updater. Not only can you download updates from Spyware Terminator servers but now you have the option to download and share it with other users. It's simple! You won't have to do anything, this is the default setting. 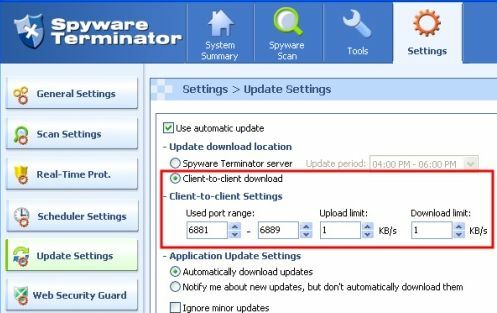 If you're using the Spyware Terminator server, you can just select the "Client-to-client download" update download location in the Spyware Terminator update settings and Spyware Terminator will do the rest for you. Users who share their downloaded updates with other users will be rewarded just like the forum users who contribute to the forum by advising other users. The more users share the updates, the easier and faster you'll be able to download the updates. Become a valuable member of the Spyware Terminator community and help us spread the current versions of both the application and the database to make the Internet a safer place. Tools that were previously located in the Utilities section of the Spyware Scan tab have been moved to a separate Tools tab so you can quickly access tools that can help you solve various problems. Restore default system settings - this utility provides you with the ability to restore different aspects of your system to their default settings, as if you just installed Windows. Look below to see an image of this utility. Restore computer to an earlier time - this utility is one-click access to Windows System Restore. Spyware Terminator will create a restore point following the completion of each scan (as long as you remove threats). This utility will let you access all of those restore points. Analyze file - this utility will let you quickly analyze a specific file on your computer. It will scan the file against Spyware Terminator's database. If you have Clam AntiVirus installed it will scan it against its database. It will also scan the most critical parts of your computer for any traces of the file. You can choose to send the results of the analysis to Spyware Terminator's servers for further analysis. Remove file - this utility will let you delete any file on your computer, even if it is locked.